“If You Can Walk, You Can Dance. Marimba music is meant to be played in together. Our classes are taught in a band format, where everyone gets to try out the different sizes of marimbas, and instantly become a part of a thriving community. Prior musical experience is welcome but not necessary. We hope you’ll decide to join us. We love to celebrate making music together! There is a place for everyone in our classes from beginners to professional musicians! Join the marimba family! Not in Austin? Learn the music with us online! Join our Patreon community where people from all over the world are learning this music with Joel! You can also check out our individual online lessons in our shop. 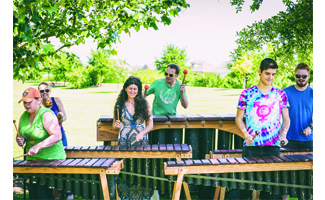 Have Marimba at Your Event! 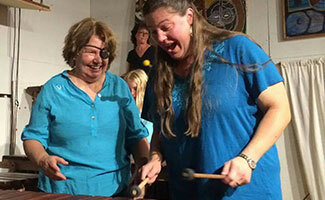 Marimba music is a high-energy, foot stomping, heart pounding, hand clapping experience. Performance highlights include Austin City Limits Festival, SXSW, Formula 1 Grand Prix, and Waco Cultural Arts Fest! Ask us about Texas Commission on the Arts Touring Roster grants. I have no musical talents whatsoever, except air guitar and car singing. I warned Joel. He laughed and guaranteed that within five minutes I would be playing the Marimba. Guess what. He was right. He and Rakefet were so patient and encouraging to all of us. 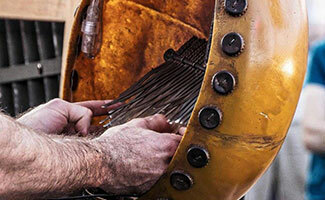 Joel Laviolette is a dedicated musician, a patient and giving teacher, and a world-class craftsman. I have been to and hosted several educational events by Joel and Rattletree. It is an experience not to be missed!! Joel is an incredible teacher for both beginners and advanced players. What is so cool about playing marimba is that you need no skill, just a willingness to jump in and play.